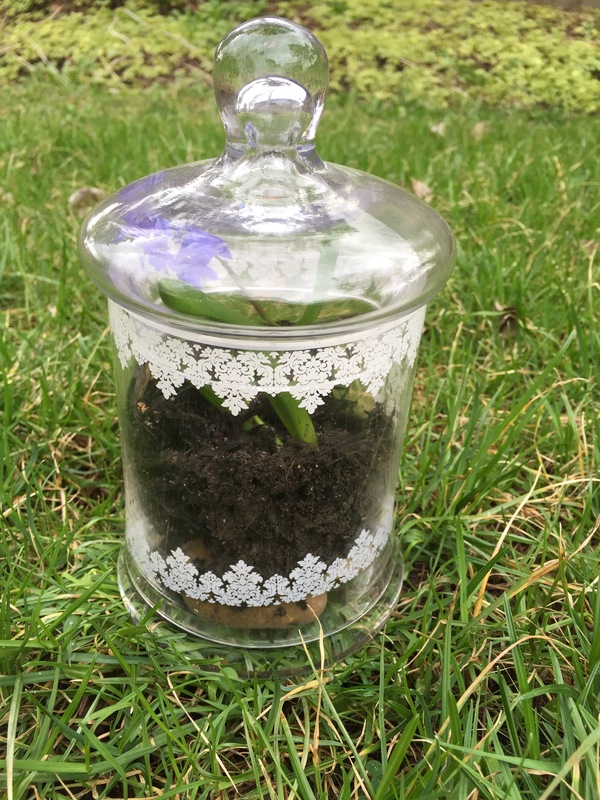 Happy Earth Day Friends 🙂 This blog post, I’m going to share this quick and easy way to add some green to your decor with some DIY terrariums. 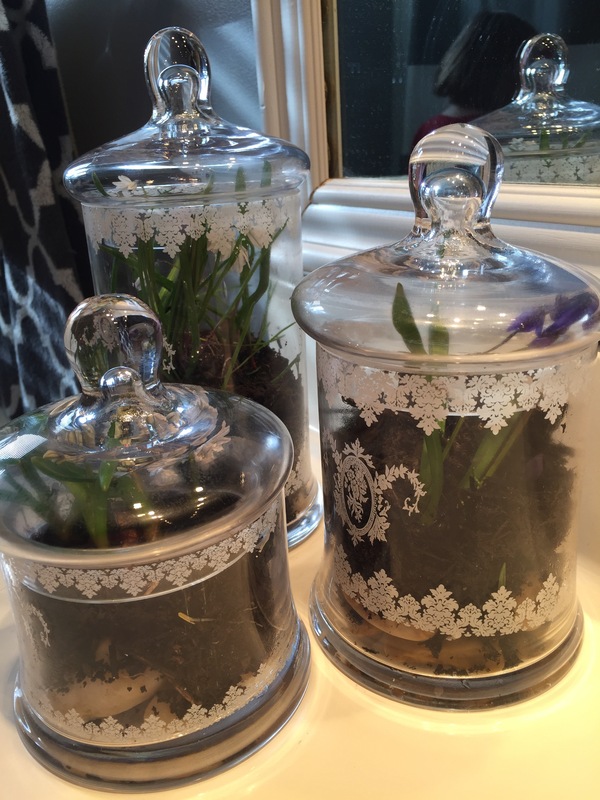 For my terrariums, I used glass apothecary jars that were on clearance at Kitchen Stuff Plus. These types of jars are typically used to store cotton balls, q-tips and bathroomy type stuff, but I don’t like to follow the rules, so I decided to put dirt in mine instead. Lol. Here is a pic of the canisters the way they are intended to be used. Courtesy: Kitchen Stuff Plus website. I love the simple shape of these jars, along with the traditional Victorian etching in the glass. The traditional style of the jar, paired with the dirt, rocks and plant make this a winning combination. 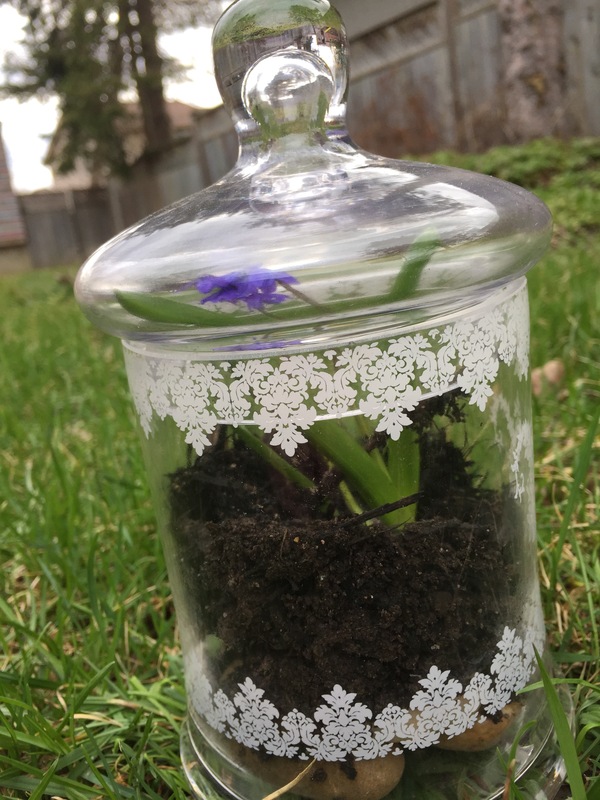 These pretty terrariums were put together using rocks I had on hand, dirt from my backyard, and some pretty purple and white flowers that have been sprouting in my front yard. 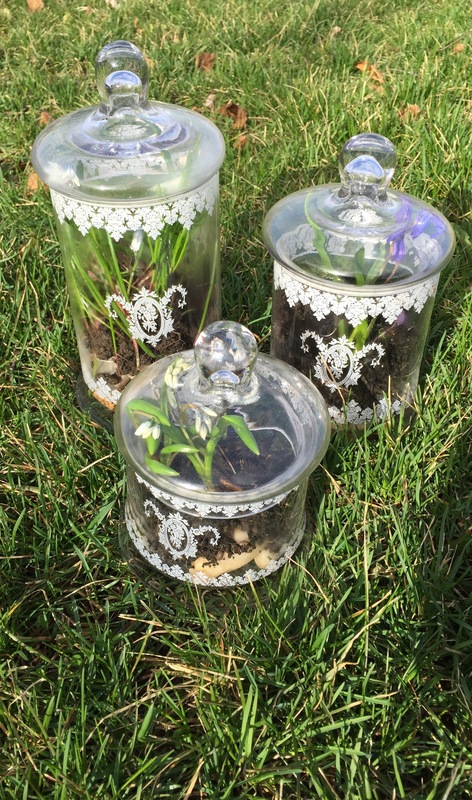 I dug up their roots, and replanted them in my jars. 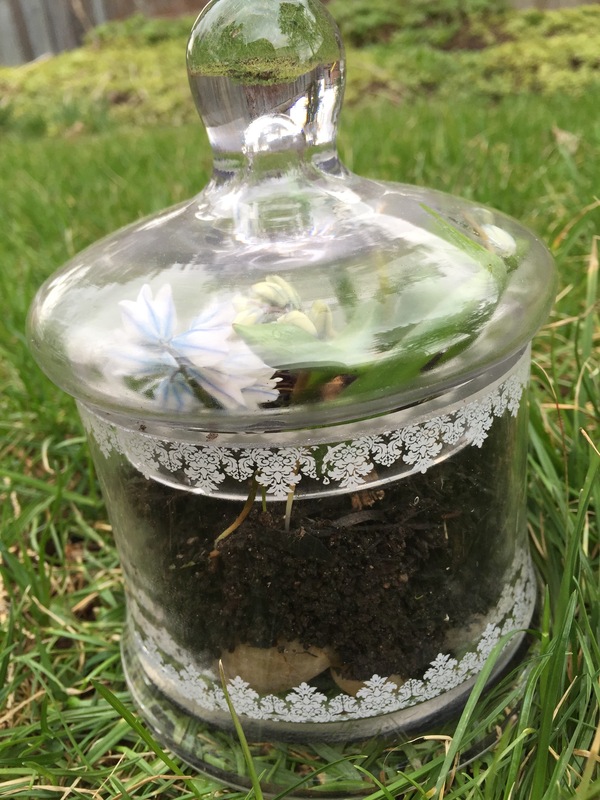 The rocks were placed in the jars first to allow for drainage, then the dirt and then the little flowering plant was added. This picture shows the etched glass detail. Here are the terrariums in their new home in the girls bathroom. Look…..there’s one in the mirror, since they follow me around everywhere I go. Any moms out there that can relate? Lol. Just for fun, here’s a pic of myzombie terrarium I created a la Walking Dead around Halloween last year. I still have it in my kitchen, because it makes me laugh. That’s it for todays post. I’ll be back again on Saturday with a new one. See you then friends, and I hope you have a very Happy Earth Day. If you enjoyed this post, please share. 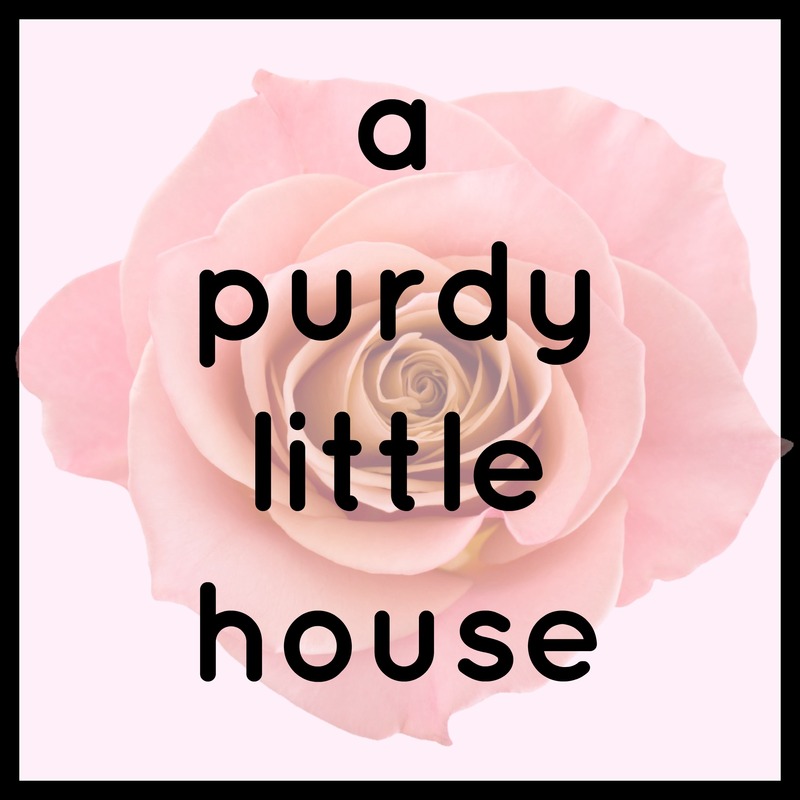 You can follow along by liking my Facebook page, following me on Twitter @suepurdyblogger, by subscribing by email, or just logging on to the blog three times a week. Whatever works 🙂 When you subscribe by email, you’ll receive an email notification whenever a new post is published.